Sei’un An (Roselyn E. Stone, Ph. D.) was born in St. Thomas, Ontario, Canada. Since her graduation from the University of Toronto she's lived in five countries (England, Germany, USA, Japan and Australia) and had three professional lives: YWCA physical director; high school teacher of physical education; and tenured professor at the University of Toronto. Sei’un Rōshi began Zen practice in 1977 on a sabbatical year in Japan. In 1978 her kenshō ('awakening') was confirmed by her teacher, the late Zen Master Kōun Yamada, of the San’un Zendō in Kamakura. In 1985 Yamada Rōshi formally granted her authorisation as a Zen master in the Sanbō-Zen Lineage. The teaching name of Sei’un An (‘Clearing Away the Clouds’) was conferred upon her at that time. In 1991 Sei’un Rōshi was invited to be the resident teacher of the Brisbane Zen Group (BZG). As she writes in Winding Road, Straight Path, ‘...on my way out to Australia for my second six-month residency, I stopped in Hawaii to visit Robert Aitken Rōshi, my ‘Dharma Brother’ (so-called because we had trained under and were authorized by the same Zen master), at his new, still-under-construction Palolo Zen Centre in Honolulu. He’d known the BZG since its inception…he leaned towards me, his eyes glinting mischievously, and asked, ‘Well, how did your time go with the BZG?’ She told him how some of the group preferred to be without a teacher while others left to find groups aligned to the teaching of Joko Beck’s Everyday Zen. Aitken Rōshi explained that in his experience, it is difficult for some groups to have a teacher after functioning on their own. In recognition of this, BZG amicably dissolved into two groups - The Mountain Moon Zen Society and the Ordinary Mind Zen group. Our group in Brisbane is linked to a formal Zen lineage, Sanbō-Zen (Three Treasures), started by Yasutani Haku’un in 1954. It is a lay lineage which combines practice elements from the two main monastic Zen traditions in Japan - Sōtō and Rinzai Zen. Sanbō-Zen has played a significant role in the transmission of the Zen Dharma to the West over the past sixty years, and has a number of branches worldwide. Several well-known teachers in the West such as Philip Kapleau, Taizan Maezumi, Kōun Yamada and Robert Aitken trained in the Sanbō-Zen tradition. Roselyn Stone (front row, six from left) at Gathering of international Sanbo-Zen teachers (Canada). Vipashin Buddha Honoured One, Shrīmālā Buddha Honoured One, Mahākāshyapa Honoured One, Mahāpajāpatī Honoured One, Ānanda Honoured One, Dammadinnā Honoured One, Nāgārjuna Honoured One, Prajnātārā Honoured One, Bodhidharma Honoured One, Zhu Jingjian Honoured One, Dàjiàn Huìnéng Honoured One, Ling Zhao Honoured One, Eihei Dōgen Honoured One, Zenshin-ni Honoured One, Hakuin Ekaku Honoured One, Mugai Nyodai Honoured One, Daiun Sogaku Honoured One, Ryōnen Gensō Honoured One, Haku-un Ryōko Honoured One, Kojima Kendō Honoured One, Kō-un Enko Zenshin Honoured One, Sei-un An Honoured One. Note for the pronunciation buffs: If a vowel has a small horizontal line above it, then it is pronounced as a long elongated vowel. For e.g., the line above the A in Ānanda is long (as in Ah-nanda). If a consonant repeats (as in Dammadinnā) hang on to the first consonant (as in Dhammmmm-madinnnnn-nah). Dàjiàn Huìnéng is pronounced as Dahjien Hweinung. Ni (as in Zenshin-ni) is pronounced nee. Shrīmālā – A buddha from antiquity. She is the subject of The Lion's Roar of Queen Shrimala, or Shrimala Sutra which became the Mahayana scripture preeminent for teaching that all sentient beings have the potentiality of Buddhahood. In this sutra, the Buddha predicts her ultimate Buddhahood and that she will be called Buddha of Universal Light. He commands Ānanda to sing her praises repeatedly. Mahāpajāpatī – She was the aunt and foster mother of the Buddha and a queen of the Shakyas. Many women turned to her for counsel when their husbands and sons left home to join the Buddha’s order. Leading the first women's rights march in recorded history, she challenged the Buddha’s exclusion of women from the monastic order and won them the right of ordination, thereby becoming the founder of the nuns’ sangha and the leader of five hundred women. She was considered chief among Buddha’s women disciples. Dammadinnā – The wisest nun in the Buddha’s time. She became a nun when her husband announced he would leave her for the monastic order. Her practice was largely a solitary one in the forest, where she developed deep understanding. The Buddha said her words were the same as his, and that Dammadinnā was foremost in insight. She had many disciples of her own and her teachings are preserved in the Majjihima Nikaya. Her Small Discourse on Giving an Elaboration (MN 44) is one of the most outstanding discourses spoken by a disciple in the Tipiṭaka, and is justly famous. It was owing to this discourse that Dammadinnā was appointed to the position of foremost amongst those who talk on Dharma. Prajnātārā - Various historians now believe that the 27th Indian Ancestor was a woman. A student of Punyamitra (who was the Buddha’s 26th ancestor), she was considered the leader of the Sarvastivadin sect of Buddhism. To escape the war and chaos of the Hun invasion in northern India, Prajnātārā moved south to the city of Kanchipuram. It was there where Bodhidharma became her student. She allegedly directed him to travel to China following her death, to spread the dharma. Zhu Jingjian – The first ordained Chinese nun. She insisted on establishing the legitimacy of her ordination and set an example for other pioneer nuns who sought to establish the nuns’ order in China. She carefully studied the records of the nuns that preceded her in India and endeavored to live up to their standards. According to the Lives of the Nuns, Jingjian was the well-educated daughter of a government administrator in northwestern China, widowed as a young woman and left impoverished and ﬁnancially responsible for her family. Ling Zhao – She was the daughter of the famed Layman Pang and his wife, and was also noted as a Zen adept. She traveled with him in poverty, seeking teaching and doing cave meditation. Her debates with her father, which she usually won, are included in the collection of Pang's sayings and poetry. She died sitting up at a chosen time, apparently as a last comment on her ability to beat him. Zenshin-ni – The first ordained Japanese nun. She was ordained at the age of eleven. Zenshin-ni travelled to Korea (Paekche) as a teenager and became the first Japanese person to be ordained Buddhist. In the year following her return, she established Sakurai Temple, the first Buddhist temple made by the Japanese. There she guided 12 novices to priesthood, including 11 nuns and 1 monk, Tokusai Hoshi, Zenshin-ni’s brother. Zenshin-ni later established Toyōra Temple, the first Japanese convent. There she looked after the health and welfare of others through chanting sutras. She demonstrated courage, perseverance, and a commitment to founding temples for women. Mugai Nyodai – The first Zen abbot, first female Zen master in the world and the first Rinzai Dharma heir in Japan. She founded Tokeiji temple, the first shelter for abused women in the world, and a system of convents. She is also known as Chiyono in certain stories, and is the subject of history, fable and fiction as the woman enlightened when the bottom fell out of her water bucket. Mugai Nyodai became the disciple of Wu-hsiieh Tsuyiian, the first abbot of Engakuji, in her middle age. She eventually founded Keiaiji Temple, which became the head temple complex of the Five Mountain Rinzai Zen Convent Association. She is still honored today in the imperial convents. Ryōnen Gensō – A female Zen teacher in 17th century Japan. She was turned her away at the monastery door on account of the fact that her beauty would be a distraction to the monks. Eventually she burnt her face, was accepted into the monastery, and became the abbot when the monk who refused her died. As temple abbot, she was known for her good deeds, which included building a bridge over a nearby canal. She was also famous for her scholarship and her temple became known as a center for learning in the Ōbaku Zen sect. She also made sure that children from nearby villages received their education at the temple. She was most celebrated, however, for her cultural achievements, which included poetry, calligraphy, and painting. The story of Ryōnen burning her face with an iron became famous and was depicted in the woodblock book Kinsei meika shogadan ("Famous Calligraphers and Painters of Recent Ages"). Kojima Kendō – An activist Japanese nun who sought equality in Sōtō Zen. The author of ‘Yaiya dekiruta’ (You can do it! ), her actions revived the Sōtō nuns' order. She was also the first leader of the Pan-Japanese Buddhist Nun Association, executive director of the Japanese Federation of Buddhist Women and the only Japanese person at both the 3rd and 4th International Buddhist Conferences. Because of Kendō’s almost single-handed effort, many sexist inequities in Sōtō Zen were changed such as low funding for nuns and no representation at high levels. 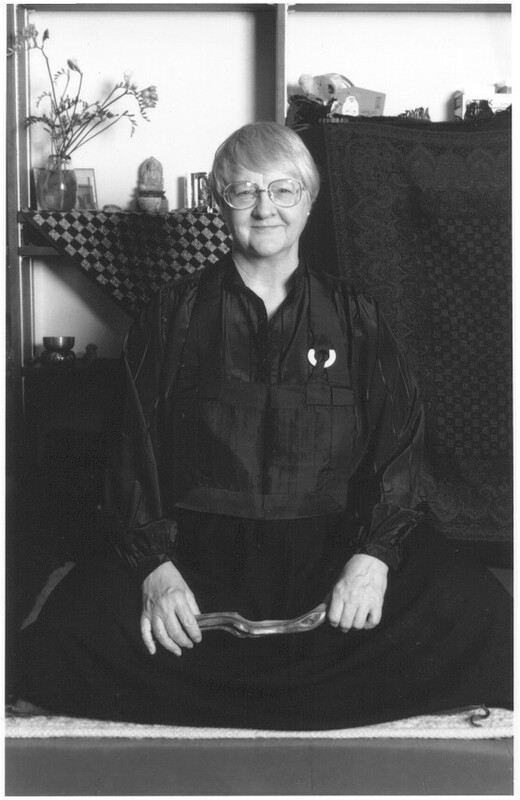 Seiun An – Roselyn Stone, the founder of Mountain Moon Zen Society. * See the following for information about the Soto Zen Women Ancestors document now used in official teacher authorization ceremonies: https://tricycle.org/magazine/roused-dream/ and https://www.lionsroar.com/chanting-names-once-forgotten/.